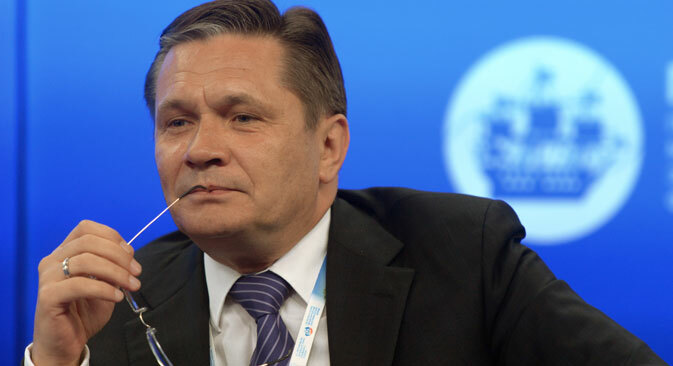 Russia’s Deputy Minister of Economic Development Alexey Likhachev talks to RIR about measures to support entrepreneurs, Russian imports of Indian meat, and amendments to the Indo-Russian Bilateral Investment Promotion and Protection Agreement. The second meeting of the Russian-Indian Working Group on Priority Investment Projects was held in New Delhi. A wide range of high priority projects were discussed, leaving both sides positive about the prospects of increasing bilateral trade. After the meeting, Alexey Likhachev, Russia’s Deputy Minister of Economic Development spoke to RIR about measures to support entrepreneurs, Russian imports of Indian meat, and amendments to the Indo-Russian Bilateral Investment Promotion and Protection Agreement. The second session of the Russian-Indian Working Group on Priority Investment Projects has just concluded. Did the session bring about any positive developments? Yes, in the sense that we not only actively, but I hope also productively, discussed both old and new projects. The difference was in the dynamism and, if I may say so, the responsiveness of my Indian colleagues. They not only set tasks for others, but also were willing to become personally involved, take on some of the responsibility. This is a big plus. The business agenda of bilateral relations between India and Russia under the new government is being formed anew. At the same time, no one questioned our longstanding strategic relationship and similarity of views on a number of international issues. I witnessed the first meeting between Narendra Modi and Russian President Vladimir Putin at the BRICS Summit in Fortaleza Brazil. Already at that time, our leaders set a task to find more practical aspects in our cooperation. The fact is that both our countries have huge economies, but at the same time, our trade turnover in goods, as well as turnover in services and investment cooperation are counted only in the single-digit billions of dollars. Of course, these figures do not correspond to the current level of political mutual understanding. For our part, we try to support the initiatives of companies, as these operate in all spheres. Moreover, we propose the development of specific projects that absolutely correspond to the local national agenda – “Make in India”. Our task is not just to deliver our goods to the Indian market, but establish manufacturing and create service centres here. All this is accompanied by a transfer of technologies to India. When the Working Group on Priority Investment Projects was being created, there were discussions on government support. Can you tell us what exactly was meant by that? Under support, this should be understood as the creation of favourable conditions for the realization of given projects. The interests of both partners coincide – for Russian companies in India and Indian companies in Russia – when it comes to issues of state regulation. I will mention one example. Indian companies are interested in supplying agricultural products to Russia. The activities of Rosselkhoznadzor (Federal Veterinary and Phytosanitary Monitoring Service), that is the frequency of its inspections and cooperation with Indian companies, will determine the ease and speed with which the companies have access to the Russian market. From the Indian side, they are talking about industrial corridors and smart cities; now we are waiting for a priority review of our proposals in this direction. In addition, if Indian state corporations when making purchases, not only ask for the delivery of goods, but also the localization of Russian production in India, we are ready to meet them halfway. We are ready to complement our proposals on the supply of vehicles, aircraft, and navigation equipment for GLONASS, with joint-venture projects in India. What is our task? To listen to entrepreneurs from both sides and clearly define what the companies need, to ensure that their projects are implemented faster – and then provide such conditions, and this of course, within the national legislative frameworks. It is clear that Russia and India will not achieve the planned volume of bilateral trade of $20 billion by 2015. Were these figures reviewed officially – at the level of state authorities? Indeed, the figures, which were declared, have not been achieved. And I dare say that they will not be achieved. Neither by 2015 nor, perhaps, even in 2015, will we be able to achieve the figure of 20 billion dollars. And qualifying my response by saying, for example, that for us $15 billion is enough, will not do. We must find out where we did not put enough effort. Where, at the state level, we did not provide all the necessary tools for the development of trade. One other project – the Free Trade Agreement between India and the Customs Union of Russia, Kazakhstan and Belarus – is again on the table, without much progress being made. Has there been any progress on the transition of our countries to using national currencies for mutual settlements? This is another important topic, which we too often speak about, but on which so little has been done for its practical application. It does nothing to repeat it like a mantra. It is necessary to provide commercial banks and businesses with more tools to work in national currencies. This is not just about opening correspondent accounts, but also about providing real opportunities for Indian companies to buy the necessary foreign exchange resources quickly and without great losses, so that they are able to work as actively with the rouble, as at present they work with the dollar or the euro. This is my critical look at the past. Did you succeed in reaching an agreement on supplying Indian meat to Russia? Yes, work in this direction is currently underway. Rosselkhoznadzor has already certified four companies for supplying beef to Russia. Besides this, Rosselkhoznadzor has planned a series of inspections to issue permits for the admission of goods of certain enterprises that are engaged in the production and supply of meat, poultry, egg powder and milk products. Part of the decisions, relating to the admission to the Russian market of Indian agricultural products, will be ratified before November 5, when a meeting will be held of the Intergovernmental Commission on Trade, Economic, Scientific, Technological and Cultural Cooperation; and a number of other decisions will be made public before mid-December. Previously, it was announced that India has invited Russia to assist in the creation of the Delhi-Mumbai industrial corridor, and other similar projects. Did Russia show interest in the proposal? This involved talk about there being companies that are willing to participate in the construction of railways and rolling stock, water systems and a smart city based on a design project by AFK Sistema. Were there any other suggestions that you had time to discuss during your trip to India? A very fresh proposal was made by Rusnano about the establishment of a Russian-Indian fund for financing high-tech projects on a parity basis, with an authorized capital of one to two billion dollars. Substantively, this project will be discussed at a meeting of the Intergovernmental Commission on Trade, Economic, Scientific, Technological and Cultural Cooperation, which I mentioned earlier. An equally important project, the discussion of which was delayed, is renewal of the Indo-Russian Bilateral Investment Promotion and Protection Agreement. What can you say about this? The previous agreement was signed in 1994, and had a more declarative nature. New documents of this kind now include dispute resolution mechanisms, guarantees for the protection of investor’s ownership rights and repatriation of earnings. For many years, this issue had not been resolved, but now it seems, we have made progress here. The Indian side expressed its readiness, for the first time, to as soon as possible – in November – discuss our proposal, and either propose amendments to the old text, or prepare a new text, in order to complete this process. You have also scheduled a meeting with Sujata Mehta, Sherpa of India in BRICS. What will be discussed during this meeting? We intend to present a report to her on our agenda during the Russian presidency of the BRICS. We are very seriously preparing for the upcoming summit of this group in Ufa, and hope that our Indian partners will become active participants and agents of these ideas. Joint development in the Talitsky area of Verkhnekamsk potassium-magnesium salts (Perm Territory) and apatite-nephelinic ore of Partomchorr (Murmansk Region). Manufacture of lighting equipment for general and special purposes, with capacity of 60,000 lamps per month at a subsidiary of the Russian company Light Technologies in the state of Karnataka. Project of the Dauria Aerospace Group of Companies and Aniara Communications involving the deployment of telecommunication devices in geostationary Earth orbit, utilizing a small low-budget platform. Creation in India of a smart city according to the Russian design project by AFK Sistema. Construction of a plant for the production of butyl rubber, with capacity of 100,000 tonnes per year in the Reliance Industries Industrial Zone in the city of Jamnagar in Gujarat State, jointly with the Russian company SIBUR. Organization of assembly production of KAMAZ vehicles in India. Creation of a Russian-Indian joint-venture to establish a joint development centre for helicopters in the 3.5-4 tonne class, based on the Ka-226T. Organization of assembly production of industrial tractors in India, with the participation of the Traktorniye Zavody Company.